Jamaica Street was planned, in 1802, as the only street of artisan housing in Edinburgh's Northern New Town. The street was were demolished in 1960 and the site was redeveloped as Jamaica Mews in 1981. "I lived in a top floor flat at 7 India Street, overlooking Jamaica Street, from 1964 until 1978. I remember walking along Jamaica Street to go to Sinclair’s grocery store, so the street was lived in at least though into 1965. I remember, well, the trepidation I had as a 5-year-old walking along a very run-down street; I normally took the longer Heriot Row route. Jamaica Street lay derelict and empty for a period, so it cannot have been demolished until at least 1965 or 1966. I remember watching the ‘bongers’ for hours as it was demolished. Does anyone have any photographs of Jamaica Street?" "My father, Robert Sergent, was born in Jamaica Street and lived there in the early 1950s. He left in 1955, came to England and joined the RAF just to get out of the poverty and have three meals a day. It's hard to believe some of the stories he tells me - they sound more Victorian than 20th century. He had a brother, Alan, and has two sisters, Agnus and Jenny. My grandfather (my father's father) was doorman at the Regal Picture House. picture house." "In Edinburgh, my father was friends with Jim Patience. He would like to get in touch with Jim again, if at all possible. Does anybody know where he is now? I hope you can help." Do you know how to contact Jim Patience. If so, please email me, then I'll pass on your message to Ian. "Ian Sergent has been looking for a friend of his father, Jim Patience. There is a Jim Prentice now living in Alberta. He comes from Leith, at about the same time"
Eddie gave me the email address for Jim Patience of Alberta. I've now passed it on to Ian Sergent. "My dad moved to Jamaica Street from Boness when he was about 11 after his mother died. He never told me about what it was like there and I would be thrilled if I could find out now. He was the youngest of 11 children and he was called James Brown. Could you tell me about him and where he lived? - There were also others that I don't know anything about. It would be nice if you could tell me about them as well." I don't know anything about Pat's dad's family myself, but perhaps somebody else will know about them. If you'd like to send a message to Pat, please email me, then I'll pass it on. "My mother was born and brought up in India Street, from 1919 until the war. She used to tell me that she and her brother and sister were banned from Jamaica Street when they were little. Once, they sneaked off there and bought sweeties. Eventually they confessed to their father what they had done because people had told them they would be poisoned by the sweets sold there. Luckily he said that they would be unlikely to be ill, but might have had short measure. He was very sensible and became a noted judge." When I was little, I used to go with my mother on the tram from Morningside to visit the grandparents at India Street. I don't remember going into Jamaica Street which seemed to be full of tenements. I do recall a barrel organ lady on the corner of Charlotte Square, and the milkman making a noise on the cobbles with his pony and cart. The India Street house had a rear extension with bath, designed by Basil Spence (!) and a coach house on Gloucester Lane (?). My memories are vague because it was 60 years ago." "Somebody was asking how Jamaica Street used to be. Well, I can tell you my experiences of the street as I lived at No.40, first flat, for a short time with my Auntie Nan Hamilton my uncle Jimmy and cousins Richard and Wilma in 1949-50. The reason for my stay in Jamaica St. was my Mother passed away in June 1949 and the family thought it would be too much for my Father to look after my Sister and myself, so we went to stay with my Dad's Sister, but strangely he couldn't live without us. The street had a terrible reputation, but I enjoyed my short stay there because I liked my relatives." "There were quite a few Pubs and on a Friday and Saturday night we would sit at the window, no telly then, and watch the drinkers spill out of the Pubs at closing time. There never failed to be a fight of some kind and if you have ever watched under-the-weather drinkers fighting, it's better than any Keystone Cops movie." "On the corner of Jamaica Street and Howe Street was Collars Limited where my Father used to get his stiff collars starched." My Aunt and her family eventually emigrated to America and lived in New York and I had the good fortune to visit them in 1958 when I was on route to Christmas Island during my Army Service. I hope that perhaps one of my Cousins might just read this. If you (cousins or anybody else) would like to send a message to Al, please email me, then I'll pass on your message to him. "My friends Peggy and Alan Banks lived in Jamaica Street in the 1950s. Alan was a skipper on the trawlers. Peggy had red hair and five bairns. Does anyone remember them?" "I stayed at 34 Jamaica Street in the 1950s. I don't remember a Banks family living in the street. The only family I remember living there, who had a dad on the trawlers, were the Coghills. They lived at 28 Jamaica Street. The father was lost when the trawler sank in the 1950s." "My Mum's birth mother lived at 34 Jamaica Street at the time of her death in 1952. Her name was Grace Hossack Cameron. She was unmarried. Does anyone have any recollection of her or could tell me about the place then . Within a day of posting her message in the guestbook, Rachel had received replies from two people who had lived ad Jamaica Street - Dave Ferguson and Jim Patience - but unfortunately neither remembersed a Grace Hossack Cameron. "When I went to St Mary’s York Lane School from 1950 to 1957 one of our class mates - Rosemary (Rossie) Carr - came from Jamaica Street. She was the class Tom Girl. I heard that she went on to become a very respected lawyer, so never judge a book by the cover. Rossie is on the extreme right of this class picture." "I had a garage in the late-1960s sixties in Jamaica Lane. They were demolishing Jamaica Street at that time. There was great hoo ha over all the copper and cables going missing." 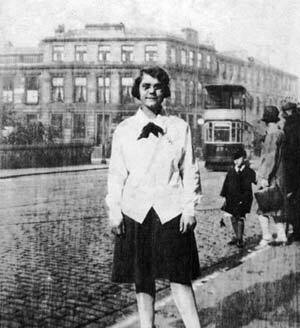 "I have no family left now, but have been trying to find out more about my family who grew up in Edinburgh. I became excited when I saw photos of people who lived in Jamaica Street and might possibly have known my family. They lived almost next door to them." "My grandmother, Margaret Mary Ross, lived at 27 Jamaica Street with her sister, Elizabeth (married name McGarry), and their father, John Ross, in the 1940s. My grandfather was on war service in the Royal Navy, docked in Leith, when he met my grandmother. They met at a local dance hall and married in Edinburgh in 1944. Does anybody remember them? If so, I'd love to hear from them." If you'd like to send reply to Michelle, please email me, then I'll pass on her email address to you. "I was born at Simpson’s in 1953 and lived at 34 Jamaica St for the first 9 years of my life. I notice that Pat Brown wrote her Recollections 2 above back in May 2010, in which she names among her uncles a Robert Brown. I suspect he’s the Robert Brown I called a friend back when I was 8 or 9 years old. I’d be more than happy to hear if he’s still with us as he owes me a penny ha’penny for some wee woodbines we all chipped in for and never saw!" 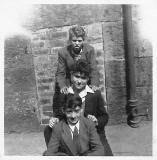 - Margaret Macintosh and her brothers who lived on the same side as us, toward the Howe St end. - a slightly older boy called Ronald Marshall who I think lived on Heriot Row with his aunt. (Obviously didn’t mind slumming it!). - Donald or Ronald Campbell who lived in one of the terraces in India Place – it says India St on the map but I’m sure it was India Place back then – and whose dad was 'Mr Fixit' of children’s TV fame, or at least that’s what I was led to believe." "I think we lived on the third floor at No.34, next to Elma Haynes and had to endure the privations of one 'lavy’ for the entire floor of flats - a particularly traumatic experience for a sensitive young boy, particularly after old Mrs Baxter had 'warmed the seat' first!" "We moved to Australia in 1962 where we have lived ever since. I was disappointed to find on my first trip back to Edinburgh, many years ago, that the old tenements had gone although some of my less savoury memories give me an insight into why they had gone. - bags of coal delivered for 2/6 to the coal bunker in the flat. - earning threepence pocket money for swapping plastic tokens. - working as a milkman's runner, collecting tokens and exchanging them for milk, while the old milkman sat Steptoe-like, all rugged-up with a tarp over his legs, on his horse-drawn cart rolling his own in fingerless mittens and a cloth cap. - burly blokes heaving beer barrels off of a dray from Ushers and down to the cellar of my Dad’s local. - getting free cocoa and a buttered bun while listening to the missionaries on a 'slide night' at the Baptist Chapel off Charlotte Square. Thank you to Pat Martin for replying to Peter Stewart's Recollections 10 above. "We are the Thomson Family. We lived at 40 Jamaica Street. I cannot remember Michelle who wrote Recollections 9, but we must have both been brought up in Jamaica Street during at least some of the same time period. - I knew the Haynes family. Were the kids not Stevie & Avril?. - I'll throw a few other names 'in the mix' and see if it stirs up any more of the olde brain cells for you! - The McDonalds who ran the shop, Nellie and Sis and Nellie's daughter (Myrtle?) who had a corgi dog. They lived in the stair next to the shop. - Nellie and Sis used to assist their old mum all the way doon from 'top flat' to sit in the shop. I wonder how many 'fourpits' o' tat ties we purchased there! LoL ! - The Dempsies, etc., etc., etc. - Jim Patience has some memories printed on the site. Did you know him? I think he was 'pals' with my older brother. I just recall the name. - They are still great friends. - I had forgotten about the 'God before the devil' ritual. Yuk! But we are still here to tell the tale! What that says, I'm not sure, except that I think the 'cleanliness' thing has gone way too far, like so many other things! Thank you, Michelle for sharing your memories. "I lived in Jamaica Street, about 1946 to 1955, but I must admit that I felt a bit disorientated when I read so many different names above that I did not recognise. - David McGarry. He was my next door neighbour, and we used to play together. - Ali Khan who you showed in a picture. "Prior to living in Jamaica Street, I lived in Cumberland Street, about 1940 to 1946. I've managed to bring up quite a bit on the Internet about Jamaica Street, but and I can find very little on Cumberland Street - just modern day property prices. Unfortunately, I don't know of pages on the Internet. That's not a topic that I've ever investigated. However, perhaps somebody will send in memories of Cumberland Street to me so that I can add them to the EdinPhoto web site. Please email me if you'd lie to do that. Thank you to Bob Sinclair for replying to the 'Cumberland Street' paragraph in Colin Strutt's Recollections 11 above. "If your correspondent looks under Scotland Places and types in Cumberland Street Edinburgh in the top RH box he will get a photo of Cumberland Street in he 1960s. That's the best I can do. Thank you to Jim McKenzie for replying to Colin Strutt's Recollections 11 above. "My formative years were spent in the New Town, Edinburgh, between 1959 and 1970. I have great memories of playing in the streets alongside the abundance of other children who populated every inch of space in those days. Although I lived in Pitt Street, now known as Dundas Street, most of my friends came from around the corner in Cumberland Street. There were, of course, two Cumberland Streets to us as Cumberland Street was divided by Dundas Street which seemed to act as a replica for the Berlin Wall back then. I had cousins who lived on the east side of Cumberland Street, (on the other side of Dundas Street) but in all honesty we did not mix outwith family gatherings. My loyalties were definitely with the west side of Cumberland Street, the one with the St. Vincent's at the end not the Cumberland Bar." "Most of our time was spent playing football in the lanes. We would play all day and all night if it was not too dark. The lanes were car-free, apart from a few working vans that were garaged there. Our favourite football games would have, maybe, seven or eight a side and the players would change throughout the three or four hour sessions. - There always seemed to be a couple of dogs who would be joining in with the game, chasing and trying to burst the ball. - On top of the surrounding walls there was an abundance of barbed wire and broken glass to contend with. - The lanes themselves would be full of sharp objects like nails, tin cans and broken bottles. I remember that my legs were constantly covered in bruises and we lads were never short of a cut or two either. "If, for some reason, we didn't have a ball, we would have to find other things to do. Often we would walk on top of the walls and jump the gaps between them. On other occasions we would play 'kick-the-can', a variant on 'hide-and-seek'. "Twice a year the football had to play second fiddle to collecting for the bonfires. Of course, on November 5 we would have a huge celebration culminating in the traditional bonfire. Not content with this annual extravaganza, the good children of Edinburgh would do it all again in May on Victoria Day. The collection of chairs, tables and anything else that would burn took priority over everything else in the weeks leading up to the fires. It was at these times that all of us would bond together in a communal effort to ensure that our street was going to have the biggest and best bonfire in the town. Street rivalries would reach 'Lord of the Flies' proportions at some times. Many pitch battles used to take place where stones were hurled back and forth and fights with cudgels were common place. "The death knells for this way of life in the New Town were heralded by the building of new estates around the city. Many of my friends simply disappeared, never to be heard of again. Having said all of that, I have nothing but great memories of my childhood in that bygone environment. It sounds like all of us should have been taken into care judging by today's standards, but nothing could be further from the truth. People did look out for each other and nothing too bad seemed to happen to the kids. Also, a load of great Scottish footballers were nurtured this way. We could do with a few of them now!" - Ian, Brenda and Alan Robertson. This was not a racist name. He simply liked the sweets 'Black Sambos'.